Ahmad Fazrul Sham finally made his comeback in the championship worth the wait when the experienced Yamaha rider not only stamped fastest time in Terengganu but made the track his season turning point by winning the actual race itself. 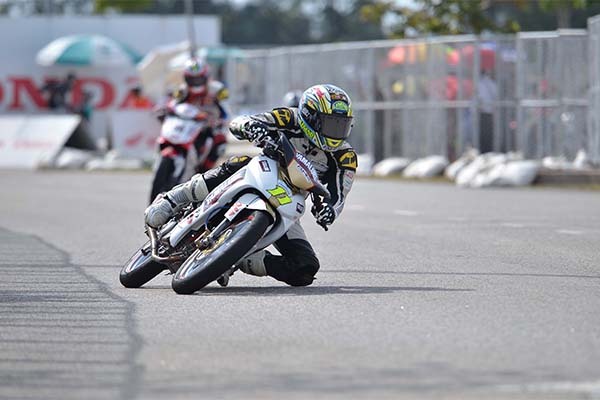 Competing in the CP130 category for the 2015 PETRONAS AAM Malaysian Cub Prix Championship, Fazrul’s pole position was challenged when Norizman Ismail took lead in the first turn with Fazrul towing closely behind. Not wanting to wait any longer, the Yamalube AHM rider slipped through a small crack made by Norizman to recapture the lead. Fazrul stayed and defended until the end while a three-way battle ensued behind him between his brother, Ahmad Fazli Sham and teammates Norizman and Zamri Baba. Fazrul continued a good pace to the checkered flag in 12:31.675s ahead of Mohd Zamri Baba in second while Fazli came home third after another astounding finish following a struggle of having to start from the mid-section of the pack. Fazli of PETRONAS Yamaha Maju Motor timed his race in 12:38.066s ahead of Norizman, Elly Idzlianizar Ilias and Mohd Amirul Ariff Musa. PETRONAS Yamaha-CKJ hometown hero, Ahmad Afif Amran finished seventh in 12:43.721s ahead of Fazli’s teammate, Abdul Muhaimin Roslan. 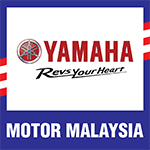 Another celebrated news for the Yamaha camp came from Kasma Daniel Kasmayudin of PETRONAS Yamaha Maju Motor who championed the CP115 class displaying amazing talent and machine control. Still needing to improve on his launch start, Kasma was first sidelined and dominated by Motul Yamaha YY Pang teammates, Tengku Amirul Haffirudin and Ahmad Abdul Kadir. It wasn’t that long however when Kasma caught Tengku’s mistake and quickly made his entrance to take lead. From then on, Kasma went on full-force swaying his race machine over means and corners with fantastic raceline. Kasma crossed the finish line first in 10:40.676s while Ahmad came in second in 10:42.135s and Tengku third (10:42.266s). Mohd Azam Omar of PETRONAS Yamaha-CKJ took fourth place ahead of Mohd Fareez Afeez. Azam’s teammate, Ahmad Syukran Aizat meanwhile finished sixth. In the Wira class, PETRONAS Yamaha teammates, Mohd Izzat Rafiq and Mohd Amirul Arif Ramlee finished sixth and seventh respectively. The race was won by Mohd Harith Farhan Baharin while Amirul Hakim Mohd Rizal and Nazirul Izzat Mohd Bahauddin came in second and third.